I am very loyal to very few facial products until I tried a trial size of SkinMD Natural Shielding Lotion. SkinMD is a shielding lotion that that forms a protective shield with the outer layer of skin and prevents exposure to environmental chemicals and irritants. Also allowing the natural oils and moisture to remain in the skin. Dermatologists who have also reviewed Skin MD state that use of SkinMD will keep skin cells looking stronger, healthier and younger for a longer period of time. The shielding lotion to keeps the body’s own natural moisture so the appearance of wrinkles is much reduced. 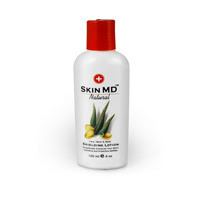 The biggest advantage is that SkinMD's shielding lotion is light and goes on without a greasy mess. I’m an artist and find that the oils and solvents I use are always drying my hands out and leaving them dry, cracked and sore. Skin MD Natural sounds great, especially as it’s non greasy and lasts so long. It seems to be getting some good press too and is worth checking out - Skin MD Natural in the UK. It uses a new advanced scientific proprietary formulation which, apparently, has a moisturizing factor 6 times greater than glycerin, the standard humectant (water absorber) against which all others are measured. It is a shielding lotion which bonds to the skin to keep the irritants out, moisture in and protects the skin in a way a normal moisturizer can’t. Well worth a look.